If you are in need of a place in your outdoor area to just sit and relax or perhaps to do some great entertaining, then talk to the team at Design West Landscaping. We can change the way you use your landscape setting by custom designing and installing a patio for your residential or commercial property. Our company has been serving the Northern San Joaquin Valley and East Bay area for many years with top notch hardscape and landscape creations. Patios have a unique way of adding aesthetic appeal and value to any outdoor space. There are so many benefits gained that you will be wondering why you didn't have it done sooner. You can have some great BBQ's with your friends and family or just simply have a nice relaxing afternoon enjoying some fresh air in the comfort of your own backyard. At Design West Landscaping we highly recommend the use of pavers. They are available in a wide range of colors, shapes, sizes and textures. This makes the design opportunities endless. You can have a custom designed patio like no other. We can find a paving stone that will suit your individual tastes and your budget as well. 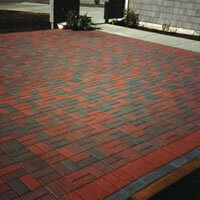 We believe that pavers are an economical material choice for the long term. They are easy to install and very easy to maintain and repairs are very simple to carry out. Damaged or cracked pavers just need to be removed and then replaced with new ones. They are a great product for your new outdoor patio. 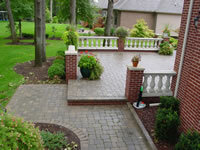 Design West Landscaping can also install your stamped or poured concrete patios. Our concrete contractors have all the experience and the expertise to get the job done right and efficiently. Leave concrete work to the professionals and you will be delighted with the results. Decorative concrete has been a popular flooring material for many decades for its ease of installation, wide selection of colors and patterns and its durability. We pride ourselves on providing fast and friendly customer service to all of our clients. It is our goal to ensure that you are 100% satisfied with your newly installed patio. Our team of professionals will guide you all the way through your project and provide you with all the information and resources you may need. To get started, simply contact Design West Landscaping today for a personal consultation!